Part of my DIY party I had over labor day, I also made a very simple necklace. So simple I tell ya. I found this DIY idea from Stripes & Sequins. Your Shopping List: You just need rope (I got mine at Hobby Lobby Craft Store in ribbon/trimmings section) of any weight you want depending on how big you want your necklace, tape, twine or string and scissors. How To: Cut two, equal in length, pieces of rope (I did 35" long each). 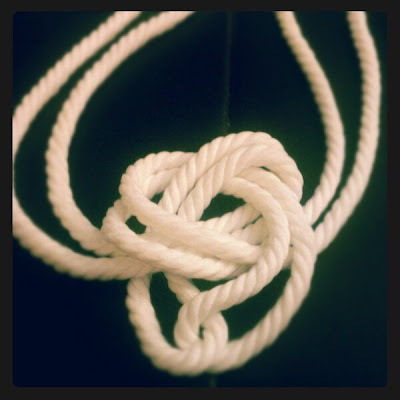 Each piece, make loops so the two ends are at the top, then lay them out and get creative with your knot (depending on the look you want). Tape the ends together to form loops that will go behind your neck, and tie them together to fasten. Yep, just a little bow. You could get all fancy and buy a clasp if you are concerned people will see the back of your neck. See photo illustrations here.